Hanoi (VNA) – Vietnamese embassies and communities abroad organized many activities to mark May 19, the 126th birthday of President Ho Chi Minh, the beloved great leader of the Vietnamese revolutionary. In France, delegates of the Vietnamese Embassy and Vietnamese representative agencies were joined by members of the General Union of Vietnamese in France (UGVF) and Vietnamese students on May 16 in laying flowers in memory of the late President at No 9 Compoint Alley, where Ho Chi Minh lived from 1921-1923, and the Ho Chi Minh Memorial at Monceau Park in Montreuil City. The same day, Prof. Hoang Chi Bao, member of the Central Theory Council, gave a talk at the Embassy about Ho Chi Minh’s thought and morality. Earlier, Prof. Hoang Chi Bao was also the speaker at a talk on President Ho held by the Vietnamese Embassy in the Czech Republic. 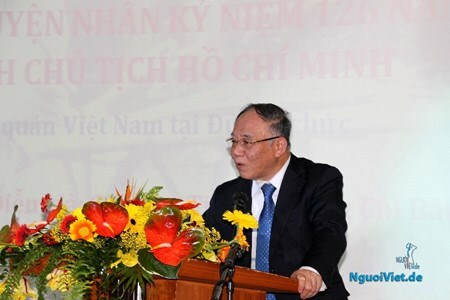 In Canada, the Vietnamese community in Montreal held a gathering on May 15, where two books on President Ho Chi Minh authored by Dr. Nguyen Dai Trang and a painting of the Vietnamese President by artist Jean-Mauriece Gelinas were introduced.